Super-heroes wear masks. Costume-ball guests wear masks. 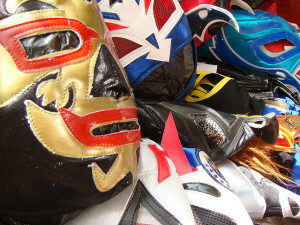 The lucha libre wrestlers of Mexico and other Spanish-speaking countries wear masks. This is not necessarily a bad thing. It’s not necessarily a good thing, either. As an entrepreneur, a mask may serve you well in some areas and strangle your success in others. The trick here, as in so many areas of solopreneurship, is being intentional, knowing when wearing a mask will help and when it will harm. Here are some criteria you can use to decide when to go masked and when it’s better to go au naturel (within reason, of course). What are your thoughts on this? Do you believe a mask can sometimes be helpful? Do you feel a mask is always inappropriate? How do you handle the masked marauders in your own life? By the way, thanks to Arturo Sotillo for posting his masks image in the Creative Commons section of Flickr. This entry was posted in achievement, entrepreneur, success and tagged authenticity, choice, comfort zone, courage. Bookmark the permalink. 9 Responses to What are you hiding? Hmmm… I love the “act as if” one, unless you’re so wracked with fear and doubt that you just need to go into a corner and collapse. But rather than wear a mask to hide the scaredy-cat voice, I’d take off that mask and face it, confront it, challenge it to a duel. Okay… forget the duel part. One way I make a choice about my mask-wearing etiquette is to ask myself the question, “Does is serve me or my clients to share this part of myself? In any way?” If the answer is no, well, there you go! Great questions, Nancy. I bet they save a lot of agony for anyone who’s smart enough to ask them. I love this take on it Nancy! I think masks can sometimes keep us from embracing all of who we are and learning from our different emotions. After all courage is not the absence of fear but acting even when you are in fear. I love the idea, Kathleen, that you think it is allowable to wear a mask under certain circumstances. I love the one about “acting as if”… I think most of us could make use of that more often. I’m still surprised, Lilia, at how easy it is to imagine what it would be like to feel a certain way and then act as if that’s how I truly feel. One of these days I’ll be consistent about applying my creativity this way! I think mask wearing is part of being human. Some people will only see masks. The beauty of being an entreprenuer is that the more ‘transparent’ the mask, the more compelling the message, and the easier it is to find your ideal clients. Thank you Kathleen! I love the idea that instead of waiting until you feel fully competent and confident, you can “act as if” and work your tail off (take action) to become that way.